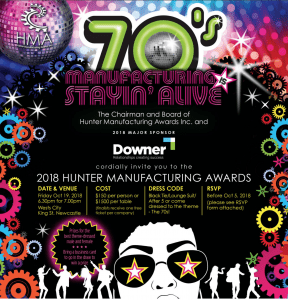 The application period for the 2018 Hunter manufacturing has now closed. Congratulations to all of or finalists we look forward to a wonderful night of celebration! HMA believes by showcasing the achievements of the best of these companies it can inspire the next generation to strive for greatness in inventing the regions future. To achieve this, this year HMA welcomes you to travel back with us to simpler time, a time where M*A*S*H and ACDC dominated our screens and radios, disco fever was rife, Paul Hogan was carving himself into our history, dancing queens all around the globe discovered ABBA and of course, the colourful fashion painting the streets. We are of course talking about the 70’s! So, save the date and get your best 70’S outfit together for what is set to be an absolutely unforgettable night. Anyone who has attended our previous dinners will be able to attest to wonderful evening. Tickets are $150pp or a table for $1500. This includes canapés, main and desert AND wine, beer and soft drinks for the night! The theme is 70’s so get creative! Or if you prefer, Black tie/Lounge Suit. Save the date and get excited! Be sure to grab your tickets ASAP via the booking form below as this is not a night to miss. The click the image below to download your invitation, please download the form and follow the instructions to accept your invitation!